Since the launch of the Sputnik 1, the first satellite, in 1957, humankind has left a notable trace in the orbit around Earth. According to the European Space Agency (ESA), in more than half a century of space activities, about 4800 launches have placed some 6000 satellites into orbit. Today, less than a thousand of them are still operational. The US Space Surveillance Network routinely tracks more than 21,000 orbiting items larger than 10 cm in low Earth orbit (LEO) and 30 cm in geostationary orbit (GEO). Operational satellites represent only the 6% of the catalogues orbital population. The 38% is attributed to large space debris such as derelict spacecraft and upper stages of launch vehicles, carriers for multiple payloads and mission-related items, while the remaining 56% has been produced by more than 200 in-orbit fragmentations. But where do these fragments come from? In the video below, the launch of Vanguard 1, one of the first US satellite. The Vanguard 1 and its upper stage, are today the oldest pieces of human-made space debris orbiting Earth. Given their orbital parameters, it is estimated that they will remain in orbit for the next 240 years. Before 2007, the principal source of debris was the explosion of old launch vehicle upper stages. Upper stages are used to give satellites the final kick into the desired orbit. In the past, after the completion of the mission, these rocket stages were often left at high altitude with small remnant of fuel and stored energy which triggered in some case explosions due to heating of the propellant or batteries, material fatigue etc. The first recorded fragmentation is dated back in 1961, when the US Ablestar upper stage exploded in an orbit of 800 km by 1000 km releasing nearly 300 large fragments and increasing the total orbital debris population by 400%. In 2011, 50 years after the event, 60% of these debris (176 in all) were still in Earth orbit due to the high altitude of the event. Artist impression of an upper-stage rocket explosion, producing debris. – Credits: ESA. Today, however, we reached a point where the majority of catalogued space debris has been produced by the few accidental or intentional collision between large spacecraft. The intentional destruction of the Fengyun-1C weather satellite by China in 2007 and the accidental collision in 2009 between two communications satellites, the operational American Iridium-33 and the decommissioned Russian Cosmos 2251, greatly increased the number of large debris in orbit and now represent, according to NASA, one-third of all catalogued orbital debris. The Fengyun 1C was destroyed in early 2007 by the Chinese military using a “kinetic kill vehicle,” which rammed the satellite at over 16 km/s. 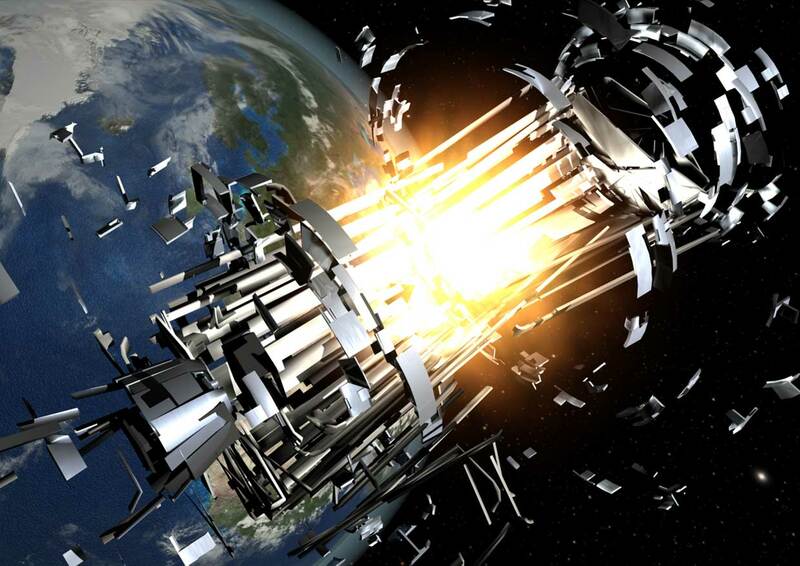 The resultant explosion created approximately 3,000 pieces of debris that continue nowadays to pose a hazard to spacecraft in LEO. The anti-satellite test (ASAT) has received international criticism for creating an operational hazard for all nations operating in space, particularly in polar orbits where collisions with the polar ring of debris is most likely. Kosmos-2251 was a 950-kilogram military communications satellite launched in 1993. The satellite has been since 1995. Iridium 33 was a 560-kilogram commercial communications satellite, part of the Iridium constellation. The collision happened at a speed of 42,120 km/h at an altitude of 789 km above Siberia. 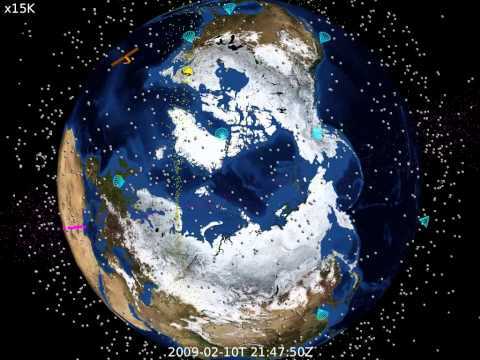 The U.S. Space Surveillance Network cataloged over 2000 large debris fragments. Generally, the higher the altitude, the longer the space debris will remain in orbit. 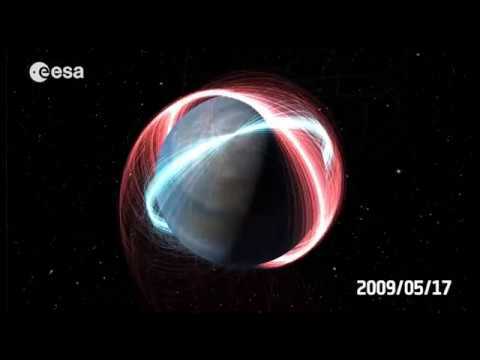 Typically, orbital debris left in orbits below 600 km normally return back to Earth within several years. However, at altitudes of 800 km, the orbital decay lasts decades and above 1,000 km, debris are not expected to fall back to Earth before a century or more. According to the dictionary, the word “mitigation” refers to “the action of reducing the severity, seriousness, or painfulness of something.” And when we talk about space debris, we definitely need some mitigation! Mitigation measures ranges from reducing the current growth of space debris by implementing operation procedures such as choosing orbits with less risk of collision with debris and, in case of a predicted collision risk, maneuvering spacecraft away from the debris path, to prevent the creation of new debris by smart satellite design, considering end-of-life passivation measures and adding end-of-life technologies, which are discussed in the next paragraphs. Unfortunately mitigation alone may not be enough to solve the space debris issue. According to the studies by J-C Liou of NASA’s Orbital Debris Program Office, even a complete halt of space launches would not be enough to produce a decrease of the orbital population in the next century. Only an active remediation effort, such as removing from the orbit at least five large objects per year combined with the necessary mitigation measures, will keep the situation constant for the next 200 years. In order to decrease the risk of creating new debris while in orbit, some procedures and technology innovations have been put in place during the years. It is common practice today to reduce the amount of mission-related debris released in spacecraft deployment and operations. The term “mission-related debris” includes all objects that are separated, or released as part of the planned mission like clamps, protective covers for lenses or sensors, spin-up devices, spring release mechanism, debris from explosive bolts and pyrotechnic devices, large dispenser in case of multiple mission and so on. Even though these objects are not a major contributor to the space debris population, they tend to stay in orbit much longer than larger debris. In the past the common practice in the past was to simply jettison such objects from the launch vehicle at separation or during the deployment of antennae, solar panels and other appendages. Nowadays the in-orbit release of such items can be decreased by using tethers or devices to trap debris when released from spacecraft or upper stages. The combustion product of solid rocket motors (SRM) represents a particular category of debris and the most serious non-fragmentation debris source. Solid rocket motors are often used in upper stages, or directly integrated into some satellites to perform an orbital transfer between the geostationary transfer orbit (GTO) and GEO. When a solid rocket motor fires, it releases particles of aluminum oxide (Al2O3) as large as one centimeter. These particles, however, don’t spend much time in orbit because they are released in the opposite direction with respect to the velocity vector of the spacecraft. The Requirements for Space Debris Mitigation for ESA Projects prevents from using SRM with a releasing burn product larger than 1mm. Collision avoidance (COLA), which is the process of preventing a spacecraft from colliding with any other vehicle or object, is also an important part of the mitigation measures helping protect especially active spacecraft. The International Space Station (ISS) has performed more than 16 debris-maneuver firings in the 15 years of life in orbit. An ISS COLA maneuver consists of a short burn by usually the main engines of a docked cargo spacecraft in order to raise or lower the orbit of the station by a few kilometers and therefore avoid an incoming debris threat. The most effective short-term means of fostering mitigation and reducing the debris growth rate is through the prevention of in-orbit explosions at the end-of-life of the space systems. If spacecraft and orbital stages are orbiting in LEO, it is recommended to bring them down to an altitude from which they will re-enter the Earth’s atmosphere within 25 years of mission completion. Alternatively, they can be re-orbited above 2000 km, in far less densely populated orbits. The choice depends on the altitude of the object and the remnant fuel at the end of life. For spacecraft in GEO, re-orbiting at the end-of-life to a graveyard orbit – about 300 km above the GEO ring, is the only feasible option, as reentering Earth’s atmosphere would cost too much in term of fuel. Moreover, the graveyard orbit guarantees that the re-orbited objects will never interfere with operational GEO spacecraft. “Design for Demise” is an engineering process established for the intentional design, assembly, integration and testing of spacecraft in order for the space systems to fragment in a desired way during the atmospheric re-entry and not cause any threat to people or property on Earth. This process, which is also part of the end-of-life disposal concepts, is becoming increasingly important as time goes by. In 1995 NASA was the first space agency in the world to issue a comprehensive set of orbital debris mitigation guidelines. Other countries and organizations have then followed issuing their own orbital debris mitigation guidelines. In 2002, after a multi-year effort, the Inter-Agency Space Debris Coordination Committee (IADC), published the “IADC Space Debris Mitigation Guidelines,” a reference document for technical guidelines, designed to mitigate the growth of the orbital debris population. The IADC presented these guidelines to the UNCOPUOS Scientific & Technical Subcommittee (STSC), where they served as a baseline for the “UN Space Debris Mitigation Guidelines,” which are a set of high-level principles accepted in June 2007 by the COPUOS and endorsed by the United Nations in January 2008. The space debris mitigation guidelines provide a framework for what needs to be done. However, the way ‘how’ mitigation measures are implemented is specified via international standards or via binding national requirements for the design and operation of space systems, as the case of the French space law. The international debris mitigation standards have been developed in the ISO-24113:2011 which defines the primary space debris mitigation requirements applicable to all elements of unmanned systems launched into, or passing through, near-Earth space, including launch vehicle orbital stages, operating spacecraft and any objects released as part of normal operations or disposal actions. Liability for space objects is governed by Article VII of the Outer Space Treaty and Article VII’s extension through the Liability Convention. According to the convention, the responsibility is assigned to a launching state for damage caused by space objects in outer space. However, after the collision between the inactive Cosmos 2251 and Iridium 33, Russia claimed not be responsible because Cosmos 2251 was no longer functional thus it was not responsible for either tracking it or for its disposal. Therefore, the space debris liability is a delicate and somehow still intentionally ambiguous topic.